Industrial Air Compressors - What Are They Good For? Industrial air compressors use an electric motor or other related devices to convert power into potential energy. Its work is to force air into a storage tank, so as to build pressure. When the tank is full or when the maximum limit is attained, the industrial air compressor closes automatically. Most industrial air compressors are rotary vane, reciprocating piston or rotary screw. The most common ones are powered using electricity, gas or diesel. When identified by the pumps they use, we have the oil-lubed and the oil-less industrial air compressors. The oil-less is more preferred as it produces air of better quality while the oil-lubed is preferred because it lasts longer. Industrial air compressors are used in several applications in both manufacturing and non-manufacturing industrial sectors. The non-manufacturing applications include agriculture, mining, recreation, service industries, and transportation among others. The manufacturing sector includes furniture, food, chemicals, and textiles among others. In metals fabrication, an industrial air compressor is applied in tool powering, injection molding and clamping. For the food industry, it is applied in bottling, conveying, vacuum packing and cleaning. Textile industry applies the industrial air compressor in spinning, agitating liquids, and texturizing. Pneumatic tools, actuators, and pumps in the mining industry also use industrial air compressors. The recreation industry involves underwater exploration where air tanks used require such compressors. Other applications include the seeding and fertilizer industry, snow making in ski resorts and sewage disposal in hotels. Service industries apply industrial air compressors in climate control, garment pressing machines and air brake systems. Reap Air Compressor Services Inc. has for a long time been known for its trusted industrial air compressors for all types of applications. Our standard products come with a warranty in order to guarantee safe and long lasting performance. Amazing how many people don't know about this. Informative! 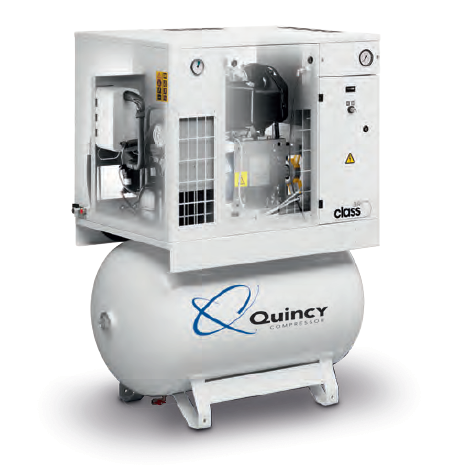 The Quincy Air Compressor line is impressive! Great investment!